MUFUMBWE PF chairman Christopher Kajilo has challenged Steven Masumba to tell the nation if he has a grade twelve qualification to be adopted as parliamentary candidate after missing constituency and district interviews to recontest his seat in Mufumbwe. But Masumba laughed off the challenge saying Kajilo was a political crook doing politics of the belly and he was part of the group that has been fighting him in Mufumbwe since 2012 when he joined PF from MMD. According to Kajilo, Masumba failed to apply for adoption with PF structures in Mufumbwe where only two other people, Jonas Lunyenze and Kennedy Muyanga, had been interviewed. Kajilo charged that Masumba has now started spreading rumours through his “call boys” that the PF officials in Mufumbwe had been corrupted to propose a weak candidate for PF. He claimed that Masumba was telling people in Mufumbwe that he could not be interviewed by PF officials at district or provincial levels because he had already been adopted by President Edgar Lungu. “I wish to advise honourable Masumba Steven to come out in the open and tell the nation if he has qualifications required as stipulated in the [amended] Constitution for him to contest as member of parliament. If he has, why didn’t he apply following the laid-down procedure from the party secretariat, PF? As the district chairman, I followed the laid-down procedures before and during the constituency and district interviews for those who applied. Honourable Masumba was not one of the applicants,” Kajilo said. But Masumba said Kajilo would be surprised to hear that the PF Central Committee had received his application. “Are you aware that at central committee, I applied and even the application forms, the receipts I have all those things? That’s one thing they don’t know because here in Lusaka, the only thing I did was before the closing date, I took the application there and the money was dropped. So, as far as the central committee is concerned, they have my application. They [central committee] would be shocked to hear that those people are saying I didn’t apply,” Masumba said. He said Kajilo and his group did not call him for interviews but like in 2012 when they again attempted to block his adoption as PF candidate after defecting from MMD, they would fail as he was the frontrunner in Mufumbwe and would retain the seat with a landslide. “Do they even have the mandate to ask for grade 12 [certificates] themselves? 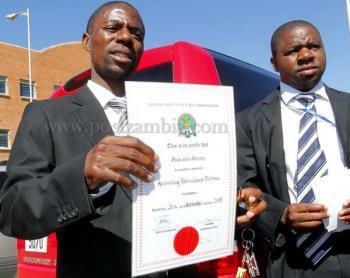 Or the mandate to ask for grade 12 [certificates] is bestowed in the Electoral Commission of Zambia? Because it is at the nomination day that you are expected to say ‘okay here I am now, these are my documents. These are my credentials’. And they are not the competent people to ask me to give them those documents. And I cannot succumb to that nonsense, anyway!” Masumba said. He said Kajilo and his group had now become part of his political rivals in Mufumbwe. But Kajilo maintained that he was following party procedure. “Who is corrupt between the person who is following the party procedure and the one who wants to use shortcuts for personal interest?” asked Kajilo.